Tell us about your role and your goals for the future? I am a nurse responsible for neonatology, an educator, and real time data reporter. I feel it is my vocation to be a great nurse. I am fulfilled in my career of over 10 years and am very interested in learning about treating my sick patients. My goal is to develop my abilities in neonatology and elevate my skill level. 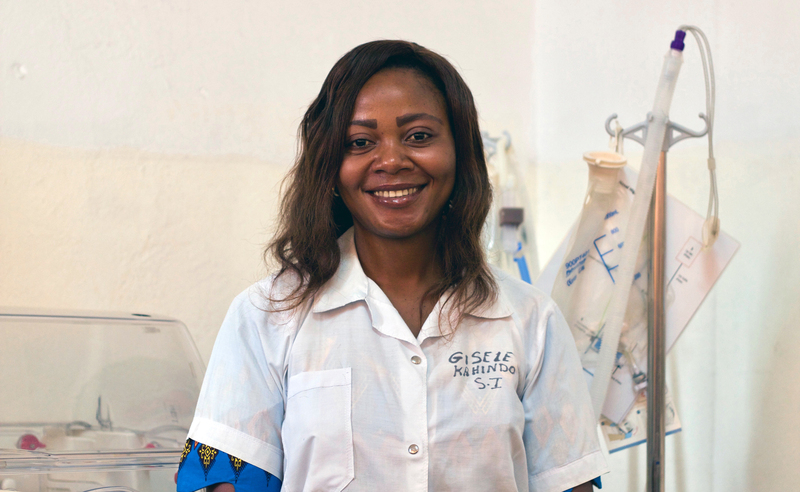 What is it like caring for babies in the Congo and what are the biggest challenges? Babies are sweet, friendly and their lives are simple. At the same time, as a nurse it is my job to be their voice. My goal is to meet the baby's needs. We understand that it is during the neonatal period that there is the highest mortality. A big challenge is the parents often don't have the means to care for their babies. Another challenge is the referring clinics in surrounding areas often lack supplies. How do the babies' parents feel about your work? Despite those challenges, the parents give us confidence. They praise us, tell us we are doing a good job and God will bless us. We in turn thank God for making us who we are and blessing our work. Tell us about being a neonatal Instructor? Being a teacher to other nurses helps me learn and refresh my memory. I am proud especially when I teach my students and in return my students do a good job. I feel I made a positive impact. Through the training program at HEAL Africa we are already seeing its impact in the community. What are you most proud of and what was the most memorable day in the hospital? Since we implemented the neonatal service, HEAL Africa has saved thousands of babies. My most memorable day in the hospital was making an umbilical catheterization for the first time on a premature 30 week old baby with Dr. Josh. The baby survived and I was very thankful. I have enjoyed working with the American team and I hope to continue working with them.